New aftermarket Tombstone Tail Light. 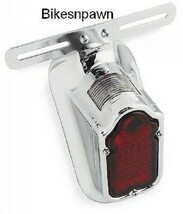 Fits Harley Davidson® models H-D#68003-47T or custom applications with smooth fender. Will not fit late model stock Harley Davidson fenders with tail light mount molded into fender .